John Kenneth Muir's Reflections on Cult Movies and Classic TV: The Visitors are Coming! 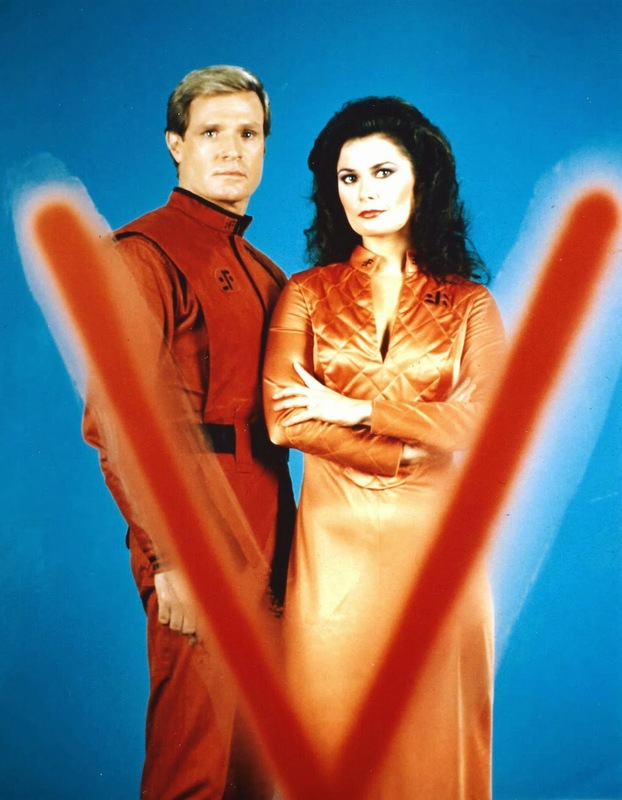 Starting this week, and moving forward over the next several weeks, I’ll be looking back at the original V (1983) franchise, which includes two mini-series, a one-season regular series, comic-books, and much more. The original saga celebrated its thirtieth anniversary last year, and this seems like a good time to remember the pop culture phenomenon, especially since I remember it with such affection. But I’m going to do a little more than that description above implies, too. In particular, I want to excavate the subject matter underlying the V saga: the (hypothetical) rise of fascism in America. 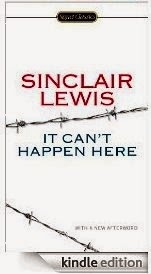 So I will be gazing at the V saga specifically, but first I’m going to back to V’s source material: the 1935 book It Can’t Happen Here, by Sinclair Lewis. It Can’t Happen Here depicts the rise of a populist fascist state in 1936 America during the height of the Great Depression. In this fictional “future,” Democrat FDR does not win re-election, and nor does a Republican rival. A closer look at It Can’t Happen Here is up first, and I’ll also be re-posting my review of a 1968 movie about fascism in the U.S.A. called Shadow on the Land, before we start up with V.
With this background in mind, everyone who is interested in joining along, please find a copy of It Can’t Happen Here, as that’s our starting point this Thursday, and then the first V mini-series for starters, which is up next Tuesday. 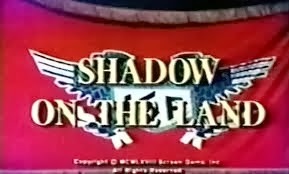 I don’t believe that Shadow on the Land is commercially available anywhere at this point, alas…but I’ll re-post the review for everyone who may remember the TV-film. Lastly, here’s a broad definition of fascism so we all know precisely what we’re talking about. Fascism is a brand of authoritarianism in which a dictator and his or her government controls all aspects of the citizenry, widely squelching disagreement and opposing points-of-view. Fascism exploits, primarily, feelings of nationalism, a fact which differentiates it from socialism. A fascist state pursues imperialist policies, namely wars, as a means of encouraging unity and patriotism among its people. In other words, in fascism the enemy is a foreign nation, or a class of people who are outside the “elite” citizen status. One key idea of fascism is the promotion of a certain class of “superior people” over more “inferior” elements. Fascism is widely equated with “Social Darwinism” and extremely dismissive of pluralism, multi-culturalism and diversity. To accomplish its goals, a fascist government emphasizes direct action and the positive benefits of violence. The weak must be purged, and the strong promoted. Also, a fascist state relies on state-sponsored propaganda to control its people, and this propaganda is basically a three-headed hydra. First, such propaganda relies on the idea or legend of a re-birth or restoration, a State emerging from a time in which it was weak and diffident. But now it is powerful. Secondly, a fascist state feeds on deep feelings of nationalism or patriotism to foster unity, as noted above. It helps to galvanize the people if they believe an enemy is knocking at the gates. And finally, a fascist state relies on romantic symbolism -- often stressing the heroic, righteous decisions of larger-than-life historical figures. This symbolism is utilized to promote ideas not just of unity, but of masculinity and youth, primarily. Since war is a major factor in fascist philosophies, it makes sense that men and particularly young men -- soldiers -- are held as significant. Women are important only so far as they can make babies, and thus create future soldiers. In terms of economic approaches, fascism is both anti-socialist and anti-capitalist. Instead, fascism (or corporate fascism…) eliminates threats to the means of production (such as labor unions), and centralizes power in the hands of elite owners, who serve the state. So, look for a review of It Can’t Happen Here, to come this Thursday afternoon. On Friday afternoon, I'll be looking at a Twilight Zone episode, "To Serve Man," which also forecasts the Visitors and their agenda. And then, next Monday is Shadow on the Land. And a week from today we start the original Kenneth Johnson mini-series: V.
I need to revisit V, should be interesting.